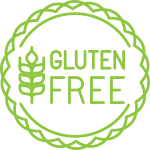 Angus Jack – Fresh food, fast. At Angus Jack, we’re serving up all your classic burger favorites your way. That means lots of menu options, gluten-free buns, and tons of fun toppings to help you build your perfect burger. We aren’t a fast food joint, but we do serve good food fast. Each meal is cooked to order and served up speedily with a smile. Customized, classic favorites that are a cut above the rest. Fresh food, fast. Fresh, never frozen, and delicious. 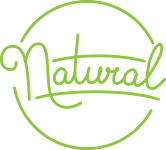 We’re a locally owned restaurant, so we care about this community. 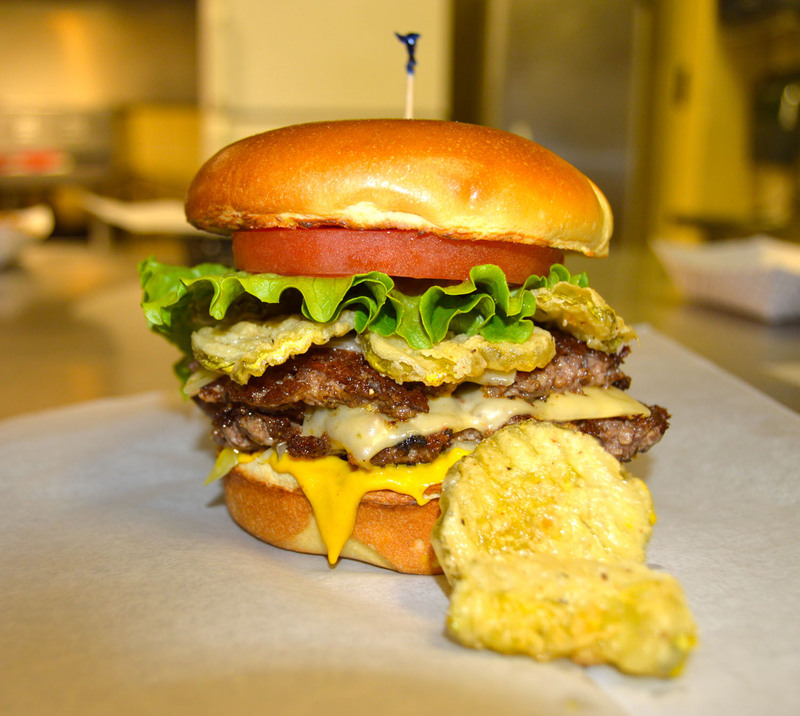 Each meal is hand-crafted to bring you the best burger in town. At Angus Jack, we don’t cook your food until you order it. We are not fast food but we’re all about fresh food, fast. 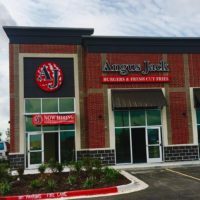 Angus Jack opened in 2013, and our owner’s father was diagnosed with Celiac’s Disease. We thought, why should we open a restaurant where our own family couldn’t eat? So we take having gluten-free options very seriously. There is a separate part of the kitchen with a dedicated fryer and bun toaster where your gluten-free burgers are crafted. All of our delicious burgers as well as our chicken sandwiches are avaliable on our amazing Gluten Free bun. We also offer a wide range of Gluten Free sides. Two patties of our fresh Angus beef and two slices of our premium cheeses. Hand crafted with your choice of sauce and as many vegetables as you like. Comes with three of our fresh Angus beef patties and three slices of our premium cheeses. Hand crafted with any sauce and as many vegetables as you choose. Bring your appetite if you’re going to handle this monster. All of our delicious burgers and chicken sandwiches with the exception of our wee six are available on our amazing Gluten Free Bun. This burger is prepared in a separate part of the kitchen with a dedicated bun toaster. 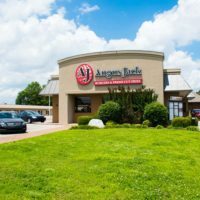 We’re located in Northwest Arkansas on Sunset Avenue in Springdale, Regional Airport Boulevard in Bentonville, and are expanding to more locations. 1001 SW Regional Airport Blvd. We love hearing from our passionate customers. 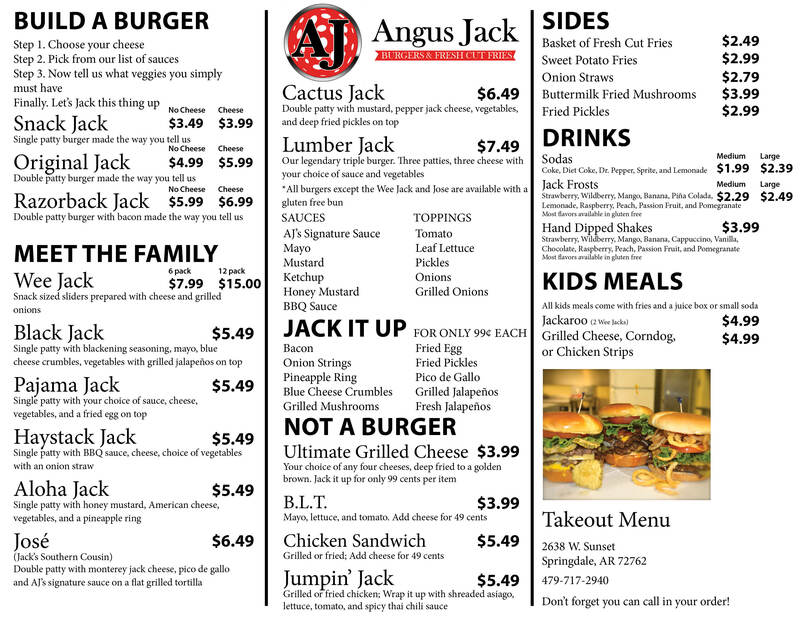 Give us a call at (479) 717-2940, or email info@angusjack.com with any feedback, fun pictures at AJ’s, or ideas for future expansions. Copyright 2017 Angus Jack. All rights reserved.